Some great squashy-stretchy claymation in here, set to the music of "La Traviata". Probably doesn't taste as good as it looks! Best polish I've ever seen on stop motion. A work of love. Wow! That's some true patience and passionate finesse! How long do you think that took? They must have planned that one out to the bone! 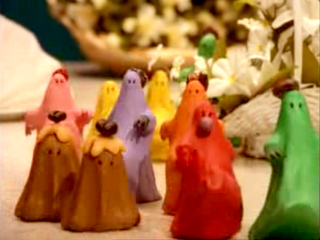 It would be cool if they did some sort of opera Fantasia with claymation. Beautifully done! I love the Stop Motion feel of it! Hey Victor, Im a student at AM, I've been reading your blog for some time. Wow, that's so awesome. Thanks for link. This is beautiful in both concept and execution, and I'm grateful for the opportunity to see this short. Although I have to say I find it a bit frustrating when I see wonderful work on such sites as youtube, dailymotion, etc. and still am not sure who should be credited. I wish it was easier for audiences to get their hands on works such as these in a way that also supports the artist... which more often than not, youtube and its ilk do not.